Description: Worldwide Aircraft Recovery is a business categorized under aircraft-dealers, which is part of the larger category automotive dealers nec. 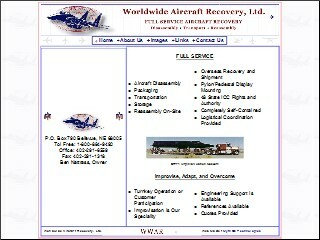 Worldwide Aircraft Recovery is located at the address 807 W Mission Ave in Bellevue, Nebraska 68005-5125. The Owner is Ben Nattress who can be contacted at (402)291-6559. Location & access map for "Worldwide Aircraft Recovery"